Nonprofit Connect is the premier place for nonprofit managers, volunteers and businesses serving nonprofits to come together under the umbrella of an association of nonprofits. In addition to offering nonprofit membership, we offer membership for the businesses and consultants that serve the sector. As an associate member, you’ll become familiar with the latest trends and developments in Kansas City’s nonprofits, receive benefits to help you market your products and services to nonprofit decision-makers, and demonstrate your commitment to Kansas City's nonprofit sector. Join the 130 businesses and individuals who already enjoy the benefits of associate membership. "I am very excited about my business partnership with Nonprofit Connect. As a business member, I have been exposed to organizations that are a perfect fit for my business. Not only have I acquired new business because of my membership, but I have also gained valuable information and contacts. I am pleased to say that I will continue to be a business member of Nonprofit Connect!" 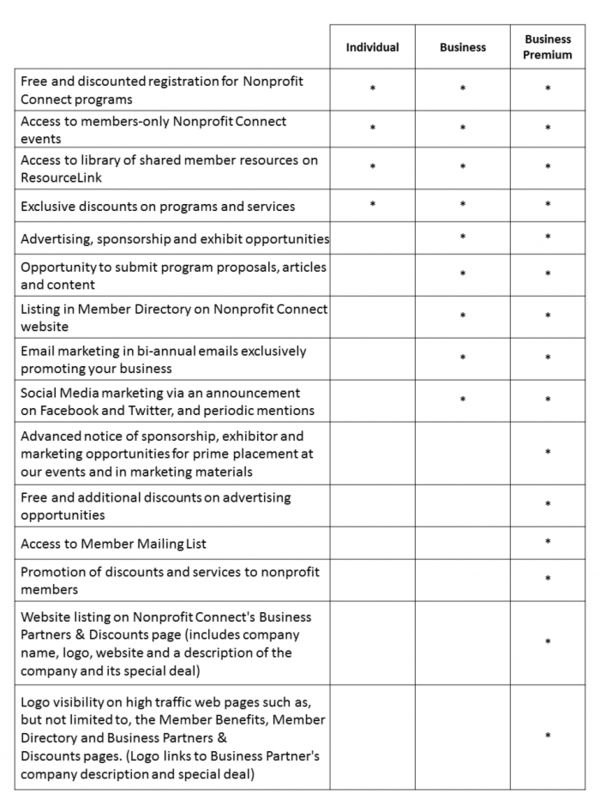 Nonprofit Connect offers three levels of associate membership with varying levels of benefits to meet your needs: Individual, Business, and Business Premium. Join Today! For additional information about membership, contact Lindsay Nelson Hughes, Membership Director at (816) 888-5602.